San Francisco: Imagine you're an engineer at Volkswagen. You've been working on one of the world's greatest luxury cars, the VW Phaeton. You've contributed to the awesome, four-wheel-drive Touareg SUV. You've also helped create the most expensive, most powerful and fastest production car in the world, the Bugatti Veyron. And then one day your boss walks in and says, "I need your help with the new VW Golf, our little compact car. Remember the Golf?" Yawn. There were probably more engineers eager to design the lug nuts on the Bugatti than there were on the entire Golf project. Thus Volkswagen birthed the new Golf - known as the Rabbit and GTI here in America - and gave us a car that teeters between brilliant and disappointing depending on your perspective. On one side, this new car is technically superior to virtually everything else on the road. Its handling dynamics and high-speed stability are second to none, especially in its lowly price class. It has a remarkably stiff chassis, robust engine and unmistakably German feel. The high-performance GTI that I tested is a blast to drive. No matter where you go - around town, on the Interstate or on winding roads - it likes to be driven hard, almost begging to be tossed around. It's also available with an amazing, high-tech, dual-clutch automatic transmission that's like nothing you've ever driven. There aren't words to describe how cool this transmission feels. When you drive a normal transmission, either automatic or manual, there's always a split second when the engine disengages from one gear and engages with another. Not only does this create a slight jerk when shifting gears under acceleration, but it also means there is a short period of time when your engine isn't pulling the car. That's inefficient and bad for performance. With Volkswagen's fancy dual-clutch transmission, one clutch engages at the same time another one disengages, so there's always a clutch transferring torque from the engine during a shift. There's no pause, no jerky feeling. Just smooth, seamless, nonstop acceleration while it shifts automatically. From that perspective, the new GTI shows off what Volkswagen's engineers learned on the Phaeton and Bugatti. It's a very modern, advanced automobile. It's futuristic. It's also a letdown. The previous generation Golf was socialism on wheels. Even though you might pay only $15,000 for your Golf, you got the same quality of fit and finish that people expect in a $70,000 Lexus. It was incredible, almost too good to be true. With this latest version, though, fit and finish have taken a noticeable dip. You can tell the engineers were mailing it in on this economy car, just waiting for the next jet-powered, carbon-fiber supercar project to come along. On my test car, one of the window controls didn't work right. When you wanted that window to go down, it went up. When you wanted it to go up, it went down. So it was just like children. When I slammed the door shut, I expected it to have that solid, bank-vault feeling you normally get with German cars. It wasn't there. It felt like it was made of crusty Cheez Whiz. The quality of interior materials was similarly disappointing. While the last Golf looked like its interior would last for centuries, the new one feels slightly spongy and chintzy, like a padded seat in McDonald's. All in all, the GTI is a great car, one that's as sophisticated as it is fun and practical. It just makes you wonder how much better it could have been if Volkswagen didn't spend so much time designing expensive ego boosters. What was tested? 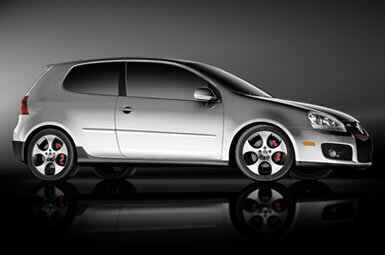 The 2007 Volkswagen GTI Four-Door Automatic with a base price of $23,675. Options: Luxury package ($3,160), DVD navigation system ($1,800). Price as tested (including $630 destination charge): $29,265. Why avoid it? It's pricey for a small car, and the quality of fit and finish has been lowered compared with the old Golf. It's disappointing to see the quality of the GTI's interior drop. The previous version of this car set the benchmark for fit and finish, but the new one doesn't quite match its predecessor's perfection.